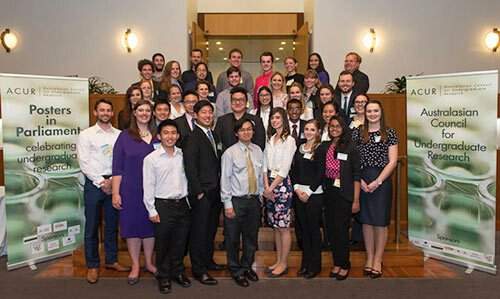 On Monday 22nd September 2014, 38 students from 16 different universities across Australia presented their research in the Mural Hall at Parliament House. Visitors included The Hon. Robert French AC (Chief Justice, Federal Court of Australia), Mr Ken Wyatt AM MP, The Hon. Mal Brough MP, Mr John Alexander OAM MP (Member for Bennelong, NSW), Mrs Jane Prentice MP, Ms Sharon Claydon MP, Senator Bridget McKenzie, Senator The Hon. Penny Wong, Senator The Hon. Scott Ryan, Senator the Hon. Kate Lundy (ACT), Mr Warren Mundine (Chair of the Indigenous Advisory Council) and other Senators and Members of Parliament as well as key high education leaders and members of the ACUR Steering Group. 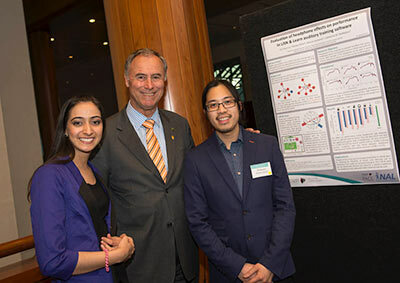 “Posters in Parliament” was an exhibition and celebration of Australian undergraduate research. Visitors commented “Fabulous inspiring futures”, “Outstanding examples of inspired brilliance”, “A great showcase of young talent” and congratulated the organisers on this “Great initiative with many collateral benefits”. This event also attracted the interest of ABC 666 Canberra Drive radio programme, which invited some of our presenters to their studio for an interview the same day. Posters presented were chosen by universities across the country and students came from far and wide to talk about their research. From fighting fires, parasite host-finding behaviours, aerial unmanned vehicles, corrosion protection to schizophrenia, childbirth trauma, language development, media relations and international currencies, the topics covered a wide disciplinary spectrum. The event aimed to raise the profile of undergraduate research within the Australian community. Undergraduate research engages the brightest and best of our young people to produce new knowledge during their undergraduate years. It attracts the most capable students and engages them in doing exceptional things within their normal courses of study. Posters in Parliament was organized by the Australasian Council for Undergraduate Research (ACUR) which was established in 2014 at Macquarie University with the intention of holding a high quality conference of undergraduate research each year at a different university. Funded by the Office of Learning and Teaching and following the inaugural events in 2012 and 2013 at Macquarie University, the 2014 conference was held last week at the ANU. ACUR is supported by a high level Steering Group with representation from 31 Australian and 4 New Zealand universities and 14 other organisations worldwide. Posters in Parliament mirrors developments internationally in presenting high quality undergraduate research to Members of Parliament. For example, Posters on the Hill is held annually in the US Congress and annual exhibition of undergraduate research posters is also held in the UK Houses of Parliament. These events are viewed as a way of highlighting undergraduate research and attracting publicity and national support. We would like to thank our sponsors: Macquarie University, Australian National University, Council of Australian Directors of Academic Development (CADAD), Emeritus Professor Adrian Lee, Office for Learning and Teaching (OLT), Higher Education Research and Development Society of Australasia (HERDSA) and Coop Bookshop.